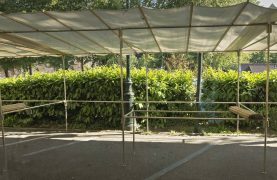 Covered Market (limited availability): traditional market stalls, 2 metres in length, with roof and table (220€). Alternatively, you may rent space by the metre and provide your own display material (70€ per metre). These fees are valid for all space booked before the Fair opens. It is possible to rent space after the opening of the Fair, according to availability and with a 20% surcharge.